This wonderful and famous work of art by great Botticelli was painted for Lorenzo di Pierfrancesco de’ Medici, a cousin of Lorenzo the Magnificent. The Medici was a very important Florentine banking family and later royal house of Tuscany. Critics are divided over the date of the work. Anyway it was certainly painted between 1477 and 1482. The Primavera (or the Allegory of Spring) is full of allegorical meanings, whose interpretation is difficult and still uncertain. Among the many theories proposed over the last decades, the one that seems to be the most corroborated is the interpretation of the painting as the realm of Venus, sung by the ancient poets and by Poliziano (famous scholar at the court of the Medici). On the right Zephyrus (the blue faced young man) chases Flora and fecundates her with a breath. Flora turns into Spring, the elegant woman scattering her flowers over the world. Venus, in the middle, represents the “Humanitas” (the benevolence), which protects men. On the left the three Graces dance and Mercury dissipates the clouds. The Allegory of Spring is a very refined work of art. The naturalistic details of the meadow (there are hundreds of types of flowers), the skillful use of the color, the elegance of the figures and the poetry of the whole, have made this important and fascinating work celebrated all over the world. Leaving out the many possible interpretations proposed by various experts, what is certain is the humanistic meaning of the work: Venus is the goodwill (the Humanitas), as she distinguishes the material (right) from the spiritual values ​​(left). The Humanitas promotes the ideal of a positive man, confident in his abilities, and sensitive to the needs of others. This ancient conception was on the way to Renaissance Humanism and Neoplatonic ideals moving around the Medici court. Neoplatonism was a philosophical and aesthetic movement trying to blend the thought of Greek philosopher Plato with the noblest concepts of Christianity. 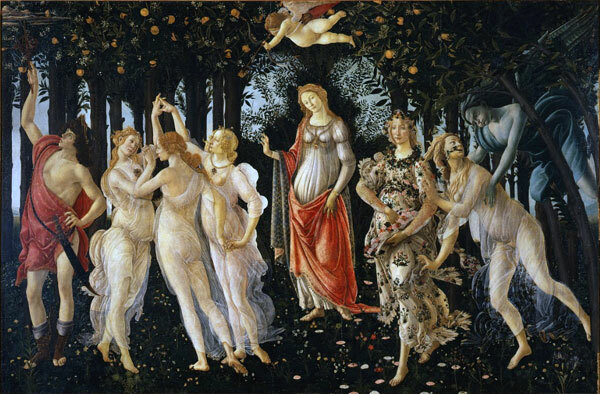 The Neoplatonic conception of the ideal beauty and the absolute love influenced the Renaissance culture and Botticelli. We can therefore imagine that behind the philosophical interpretation of the painting, Botticelli and his client thought of an apology for the Medici and their sophisticated, far-sighted and deep love for culture and art. Rooms 10-14 in the Uffizi are dedicated to Botticelli and a few other artists, where you’ll also find Botticelli’s famous Birth of Venus.